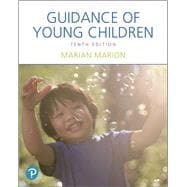 Written in a conversational style, yet solidly grounded in child development theory and research, Guidance of Young Children, 10th Edition focuses on positive and developmentally appropriate guidance of young children. Based on the author’s belief that adults need to have realistic expectations of children, the book emphasizes understanding young children’s development in addition to major guidance theories. Real-world examples and case studies illustrate guidance in action, while analysis and application activities give readers a chance to construct their own basic approach to child guidance. With this foundation in place, teachers are encouraged to think critically and make intentional, informed decisions that positively impact the children in their care. The 10th Edition enhances its focus on positive guiding strategies with new information about the authoritative caregiving style, an emphasis on encouragement over praise, additional information about the high rate of childcare and preschool expulsions, and more school-based examples at the pre-K and K level. The Enhanced Pearson eText provides a rich, interactive learning environment designed to improve student mastery of content with embedded videos, reflection questions, and application exercises.